First published in 1603, in a pirated quarto edition titled The Tragicall Historie of Hamlet and then in 1604 in a superior quarto edition. Hamlet is probably the most famous of Shakespeare’s tragedies. The source of the story of Hamlet is actually quite old. Some scholars date the tale of a hero-as-fool tale to classical antiquity. The most likely immediate source for Shakespeare was Thomas Kyd’s The Spanish Tragedy. There is a long standing rumor that the source of the play was the death of Shakespeare’s own son, Hamnet. Most scholars dismiss this as a folk tale since there is more in the play that is linked to common sources than to Shakespeare’s life, and the name “Hamnet” was actually quite common in Shakespeare’s time. The play has been in some production ever since it opened. It has made its way into numerous languages. It is a staple for Shakespeare companies the world over. There are too many film versions to enumerate, but one of the most recent, starring and directed by Kenneth Branagh was enormously successful. A 2000 film production by Michael Almereyda re-tells the play in modern day Manhattan. The film stars Ethan Hawke as Hamlet who is a young film student. Claudius remains the villain as the head of a large film corporation, “Denmark Corporation,” who has taken over the company by killing his brother. Hamlet has had such a profound on culture that there is even an episode of The Simpsons which offers an animated comic version of the play. 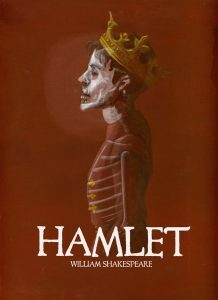 In addition to the multitude of stage and film productions, there has also been other plays that were inspired by Hamlet. Tom Stoppard’s 1966 play Rosencrantz and Guildenstern are Dead tells the story of Hamlet from the point of view of these two minor characters.